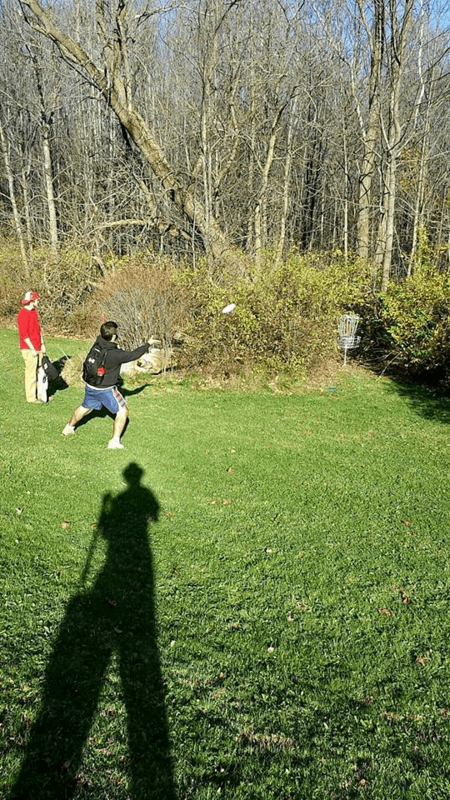 Hiram College’s Disc Golf Club reached the goal it set in fall 2014 to create a nine-hole disc golf course. Open to students, faculty members and the public from dawn until dusk, the course curves around campus and its athletic fields. Thanks to the new course, the Hiram Disc Golf Club is already attracting new recruits to its 50-member club, according to club president Aaron Acus-Souders. “The Disc Golf Club has been instrumental in accomplishing our chief goal of building a course on campus for everyone’s enjoyment. Disc golf is a fun sport for anyone, from the casual weekend ‘discer’ to the everyday professional,” Acus-Souders says. Freshman Matthew Peterson, a new club member who has already tried out the course, gives it a thumbs-up. Acus-Souders has more plans in store for disc golf at Hiram. He scheduled a student-faculty tournament for the three-week portion of this semester. He also hopes for funding to expand the course to a full 18-hole course. In addition, Acus-Souders would like Hiram to host bi-annual tournaments; one in the fall semester and one in the spring semester. Nick Rollison will follow Acus-Souders and lead the disc golf club next year. To see photos of the course and action shots, visit the Hiram College Disc Golf Course Facebook page.